Tony Tomelden, owner of The Pug, stands behind his bar on Washington, D.C.'s H Street. Photo by Ian Wagreich/U.S. Chamber of Commerce. Walking down Washington D.C.’s H Street Corridor is a study in contrasts. On a sunny fall day, you’ll see young professionals scarfing down Portobello, arugula, and goat cheese sandwiches at tables outside of Taylor Gourmet. But another block down, you’ll see a row of storefronts with bars on the windows—businesses that are open but foreboding. At night, there are lines of bicycle-riding hipsters mingling with couples who drove over from the Virginia and Maryland suburbs—all of them waiting to get into the numerous bars and nightclubs that line the street. But you’ll also see groups of men congregating outside the Quik-Marts and liquor stores, yelling at each other. It’s clear the area is changing. Whether everyone is comfortable with the change or not is another story. In the aftermath of Washington, D.C.’s 1968 riots following the assassination of Dr. Martin Luther King Jr., the H Street Corridor was decimated to charred remnants and vacant buildings. The illustrious past of the neighborhood, once a bustling commercial district and home to Washington’s flagship Sears Roebuck store, was nowhere to be seen. And it stayed that way for nearly four decades. Sartre's worldly prostitute would appreciate the conflict-filled new H Street story line: the wealth of Capitol Hill marches up steadily from the south toward the shopping strip, accompanying the return of prosperous white families to the District. They start to hanker for upscale improvements to the troubled street. Meanwhile, longtime residents north of H Street, many of them poor or working-class and most of them black, begin to fear economic displacement if the pace of change is too quick. The 2001 purchase and 2005 reopening of the historic Atlas Theater turned the spark of revitalization into a wildfire. City support followed with the H Street Overlay and the Great Streets Initiative and promises to put in tens of millions of dollars of street improvements and streetcar tracks. The city’s efforts worked. Anwar Saleem, executive director of civic association H Street Main Street told The Washington Post that the number of vacant properties shrunk from 50% to 15% in just five years. Englert didn’t go alone. He brought along a group of friends and co-workers including Tony Tomelden, a bartender at Englert’s Capitol Lounge, a popular watering hole Englert owns just steps from the House office buildings. Tomelden owns H Street watering hole The Pug, short for The Pugilist, as evidenced by the boxing memorabilia that dons the bar walls. “When Joe first said, ‘We’re all going to H Street,’ I didn’t believe him,” recalled Tomelden. Eight years later, the building Tomelden bought for a comparative steal is home to his beloved “dive bar” and foodie hotspot Toki Underground, which is, ironically, upstairs. That’s not to say Tomelden’s tenure on H Street was without its hiccups. The Pug’s opening was delayed for two years after a permitting fight between local fast food businesses and the Advisory Neighborhood Council led to all permits being put on hold for nine months. There’s no question that H Street is on its way. And the accolades are piling up. Forbes listed it at #6 on its list of America’s Best Hipster Neighborhoods. USA Today dubbed it one of the 10 up-and-coming neighborhoods. It was a 2013 recipient of the Great American Main Street Award. And this year’s H Street Festival drew a record crowd of 100,000. Real estate is booming. Dwell real estate firm owner Jennifer Myers cited her client who bought a foreclosure in the neighborhood in 2005 for $220,000 and had just sold it for $589,000. The experience is not unique. One property on the market at the time this article went to print was listed at $693,500, a 230% increase over its previous sale of $210,000 in 2003. The massive increase in real estate prices belies a neighborhood that is still very much in transition. The Pug, Toki Underground, and the other hotspots have made the neighborhood a bustling hipster paradise after the sun goes down. But daylight hours reveal a different H Street. The bars and restaurants are quiet, exposing the lack of daytime businesses that the neighborhood needs to get to the next level of redevelopment. Nestled between check cashing operations and wig supply stores, a small banner hangs above a business that is eager to open. Brother and sister entrepreneurs Sean Emery and Erin Losie have been working to open their Old City CrossFit gym on H Street for months. Expansion of the entire area, which has been steady for the last seven years, is about to hit a fever pitch. One major hurdle to revitalization—lack of a neighborhood grocery store—was cleared when a Giant opened in May. The recent announcement that Whole Foods will be moving onto the block in 2016 will take the neighborhood’s flirtation with “yuppieville” to a committed relationship. Another hurdle—lack of direct, fast transit—is about to be a thing of the past. In the Anacostia neighborhood of Washington, D.C., three streetcars sit parked at a testing facility. Their future, much like the H Street Corridor that they will serve, is congruently uncertain and inevitable. 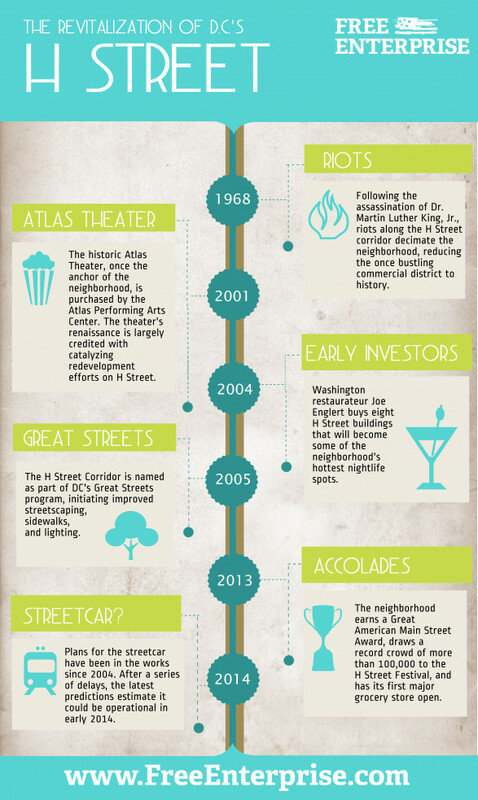 For more on H Street, check out photographer Ian Wagreich's gallery on Flickr and the infographic below.